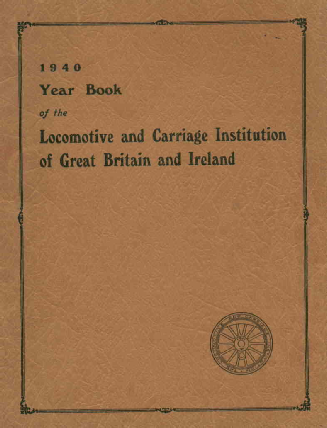 The 1940 Year Book of the Institution is a surprisingly lavish publication considering that the Second World War had just started. The 1940 Presidential Address by W.S. Graff-Baker, Chief Mechanical Engineer (Railways) L.P.T.B. Advertisement for Metropolitan-Cammel Carriage & Wagon Ltd. Messages from the Presidents and Vice Presidents in 1940. There were five classes of membership in 1940 (Members, Associate Members, Students, Fellows and Associate Fellows). Annual subscription for a member was 7 Shillings and 6 Pence. The split between Members and Associate Members was between Supervisors over 25 years old (Members) and Enginenmen, Firemen, Fitters or craftsman 21 years and over (Associate Members).